QuickBooks Connection Manager is SSIS Connection Manager for establishing QuickBooks connections. Use the API to build components based on QuickBooks Connection Manager. The installation includes application for remote web access of QuickBooks Desktop Edition database. The application is found in COZYROC installation sub-folder Tools. The name of the application is QbConnector.exe. 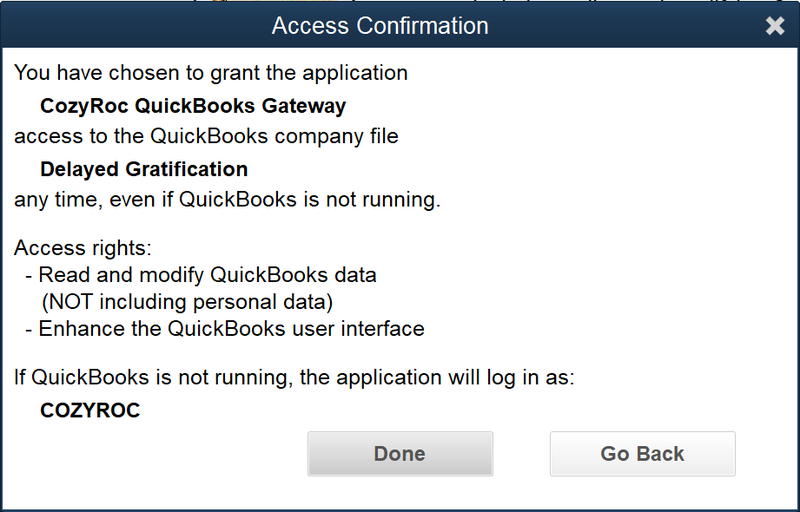 Before you are able to work with the data for the first time, you have to enable QbConnector application to access the data in your QuickBooks Desktop application. Please review your QuickBooks documentation how to enable third-party access to your data. Use the options below to setup the gateway. Specify network port. This port will be used by the remote clients to communicate with the server. Specify log file to trace communication. Enable only during test because it will slowdown the communication. Specify QuickBooks database connection mode. This property has the options listed in the following table. Default Connect in the mode QuickBooks is already open (default). Single Connect in single user mode. Multi Connect in multi user mode. Specify what remote client addresses are allowed to connect to gateway. This property has the options listed in the following table. Any Any remote client can connect to gateway (default). Address Only specified remote client can connect to gateway. Use Users tab to setup credentials of users, which can access the gateway. Optionally select user-associated company database file. If database file is not specified, the user will connect to the database currently open in QuickBooks. Specify to use secure (HTTPS) protocol for communication. This property has the options listed in the following table. Disabled The secure communication is disabled (default). Embedded Certificate The secure communication is enabled using the embedded X.509 certificate. User-defined Certificate The secure communication is enabled using the user-defined X.509 certificate. Specify after how many minutes of inactivity the QuickBooks database session is closed. In this section we will show you how to set up a QuickBooks Connection Manager to access QuickBooks Desktop Edition. In QuickBooks, click on Edit and then select Preferences from the menu options. Select Integrated Applications from the list. Ensure that the checkbox for “Don’t allow any applications to access this company file” is NOT checked. Click OK to exit the Preferences. 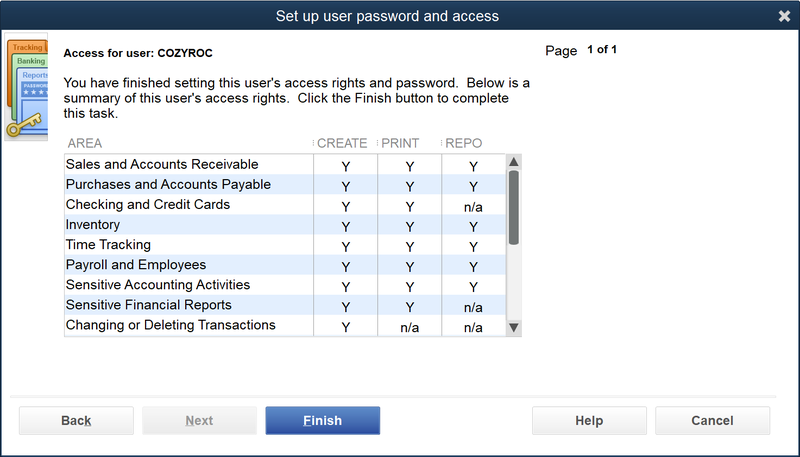 Set up a User account and password in QuickBooks for the Connection Manager to use. In QuickBooks, click on Company. Click on the Add User… button. Enter User Name, Password and Confirm Password for the new account. 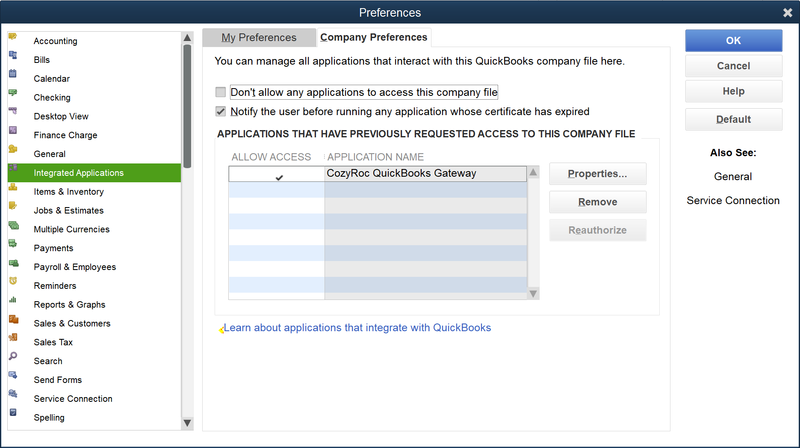 Select the areas of QuickBooks to which you want this user account to have access. We selected All areas of QuickBooks in this example. If you select Selected areas of QuickBooks, you will go through several more screens to choose the access to allow in each area. If there’s a warning pop-up to confirm your selection, click Yes to confirm. A pop-up will display all the areas to which you have given this user access in QuickBooks. 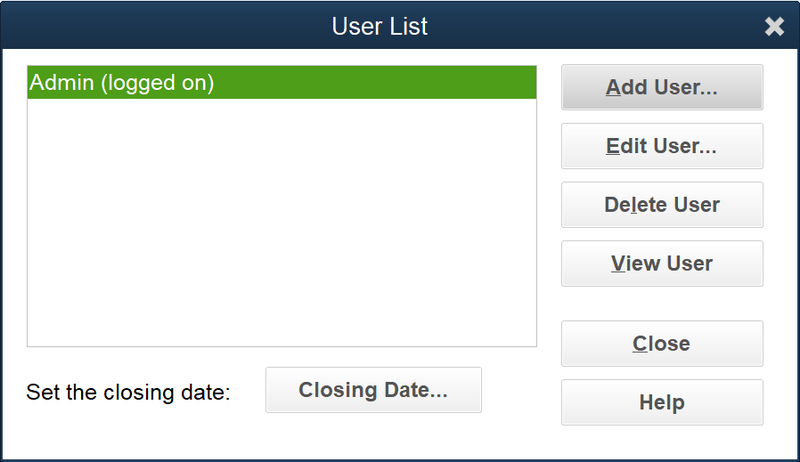 The User List will now display the new user you just set up. 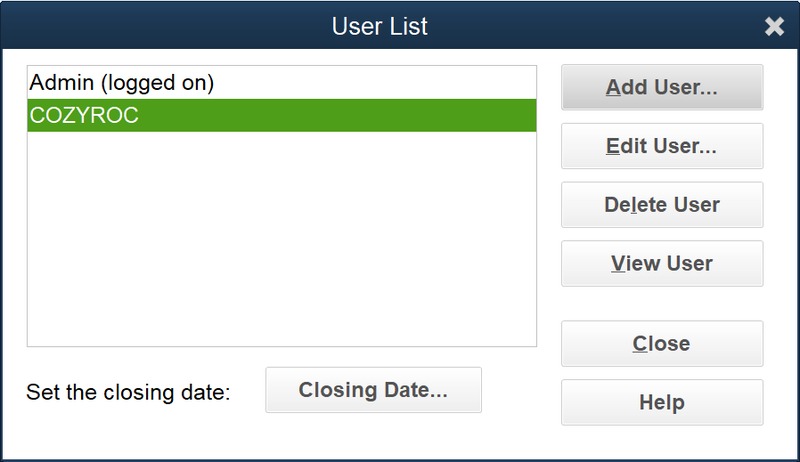 Click on Close to close the User List. 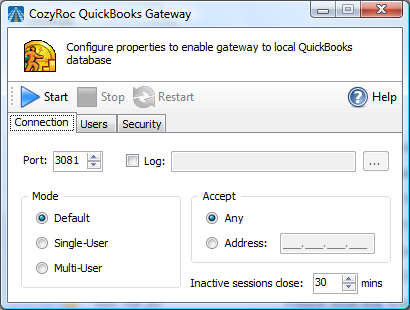 Configure and start the COZYROC QuickBooks Gateway. This application must be run on the same server as the server where QuickBooks Desktop Edition is running. QuickBooks Desktop Edition does not provide any support for access over a network. 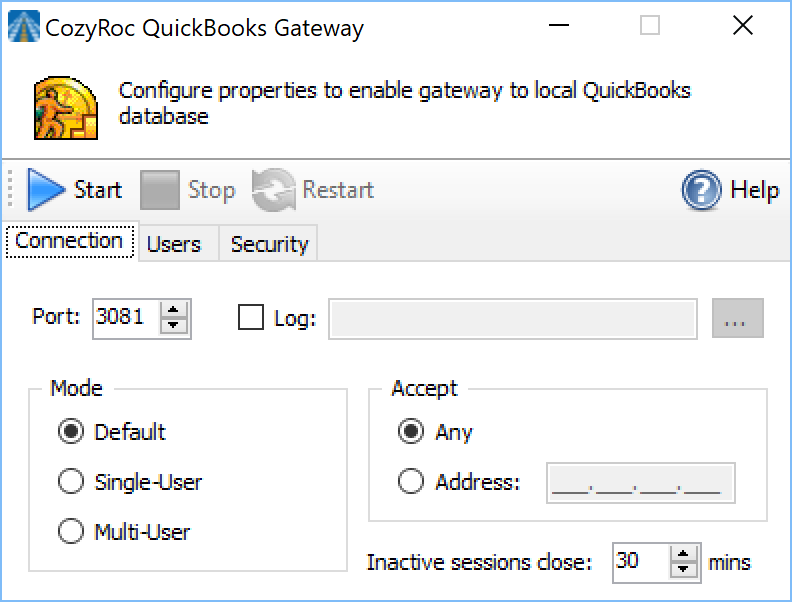 Therefore, the COZYROC QuickBooks Gateway is used to provide that connectivity to your SSIS packages. Using Windows Explorer, find QbConnector.exe by adjusting this path for your server: C:\Program Files (x86)\CozyRoc\SSIS\Tools. Double-click on QbConnector.exe to open the application dialog. In the Connection tab, ensure that the Port is set to 3081. Choose the Mode you would like to use. In this example, we are using Default. You may choose to Accept a connection from Any address or you may specify a specific Address. In this example, we will accept a connection from any address. 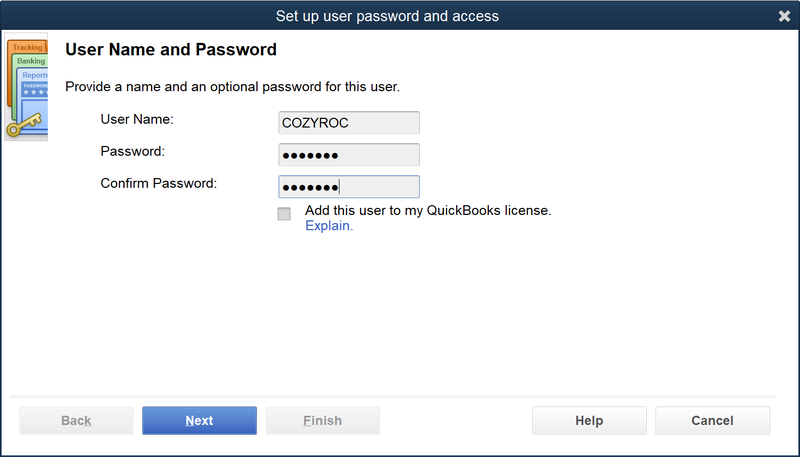 Type in the Name and Password of the account you just set up in QuickBooks for the COZYROC QuickBooks Gateway to use. Click on the ellipses next to Company and then select the QuickBooks company file for the QuickBooks company you want to access. Click on the Add button to add the new user. Choose the appropriate security option for your environment. In this example we’ll choose Disabled. Note that if you select Disabled here, you will use http:// in front of the server’s address in step 35. If you select one of the security options that uses a certificate here, you will use https:// in front of the server’s address in step 35. If you get a pop-up with a Windows Security Alert, check the appropriate checkbox and then click on the Allow access button. Set up the QuickBooks Connection Manager in Visual Studio. Select New Connection in the pop-up list. Scroll down to find the QuickBooks connection manager in the list and select it. When the configuration dialog opens, enter the IP address of the server where QuickBooks resides with 3081 as the port. If you selected Disabled under the Security tab of the QB Connector, this should start with http://. If you selected one of the certificate choices, this should start with https://. Enter the User name and key for the user you set up in QuickBooks for this application to use. Enter the password in the key field. Ensure that you have the QuickBooks company file open in QuickBooks that you want to access. 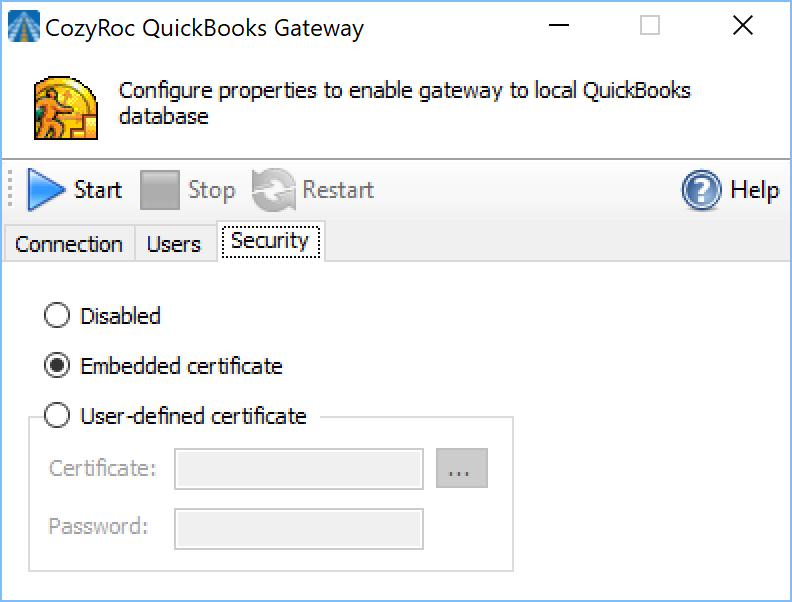 When the QuickBooks – Application Certificate pops up in QuickBooks, select one of the yes choices under the question Do you want to allow this application to read and modify this company file? 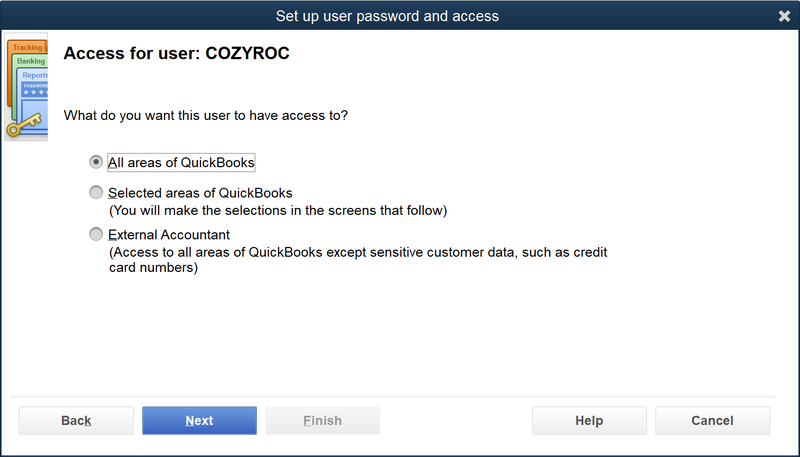 You may be asked to confirm your selection in the CozyRoc QuickBooks Gateway – Authorization pop-up if you chose to allow this application to access the company file even if QuickBooks is not running. If you chose Yes, always; allow access even if QuickBooks is not running, then enter the User name of the account to be used to login from your SSIS package. You may or may not want to check the checkbox for Allow this application to access personal data such as Social Security Numbers and customer credit card information. You will see an Access Confirmation pop-up. Click Done. Now you should be back in Visual Studio and should see Test Connection succeeded. Click OK.
Click OK again to close the connection manager dialog. 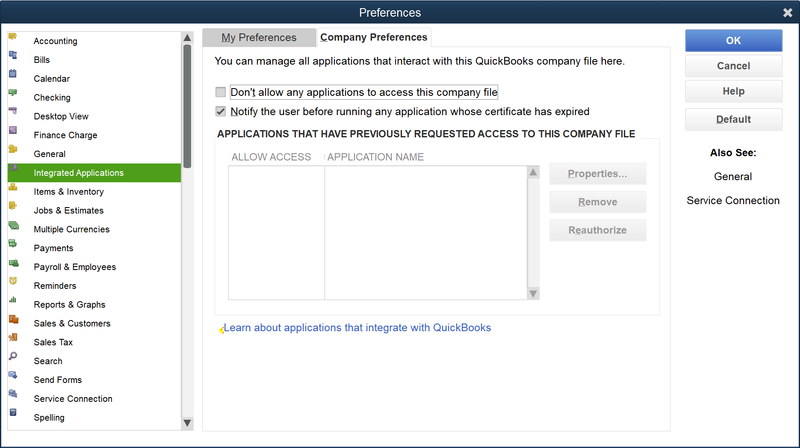 If you go back into QuickBooks and look at the Integrated Applications settings in the Preferences, you will see that the User account used by your SSIS package now shows up as an application that has requested access to the company file. Congratulations! You have successfully configured a QuickBooks connection manager. Use the Server page of the QuickBooks Connection Manager dialog to specify properties for connecting to QuickBooks service. Select QuickBooks deployment type. This property has the options listed in the following table. Desktop QuickBooks deployed on premise (default). Select QuickBooks Online connection token file. If token file doesn't exist, you have to create New... token. Specify the name or IP address of the QuickBooks service. Specify connection key to access QuickBooks. For QuickBooks Online Edition (QBOE), review "How to get QuickBooks Online Edition connection key?" below. 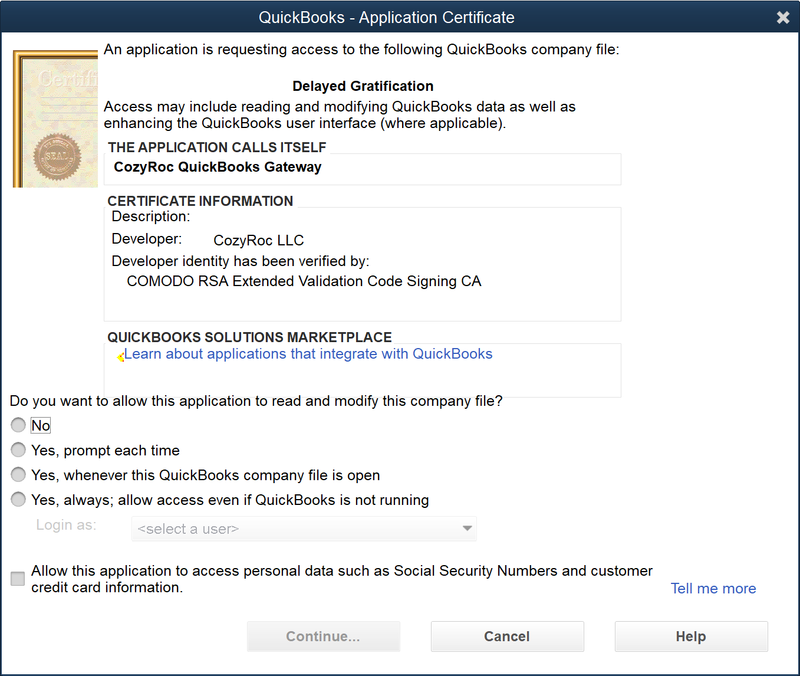 Specify application identifier to access QuickBooks. For QuickBooks Online Edition this is mandatory parameter. The default identifier: 374225725. This property is not visible in the connection manager dialog. Specify QBXML version to use with QuickBooks Desktop. Use the Proxy page of the QuickBooks Connection Manager dialog to specify properties if your server is behind firewall. Where can I find the documentation for the QuickBooks Connection? DEPRECATED: How to get QuickBooks Online Edition connection key? 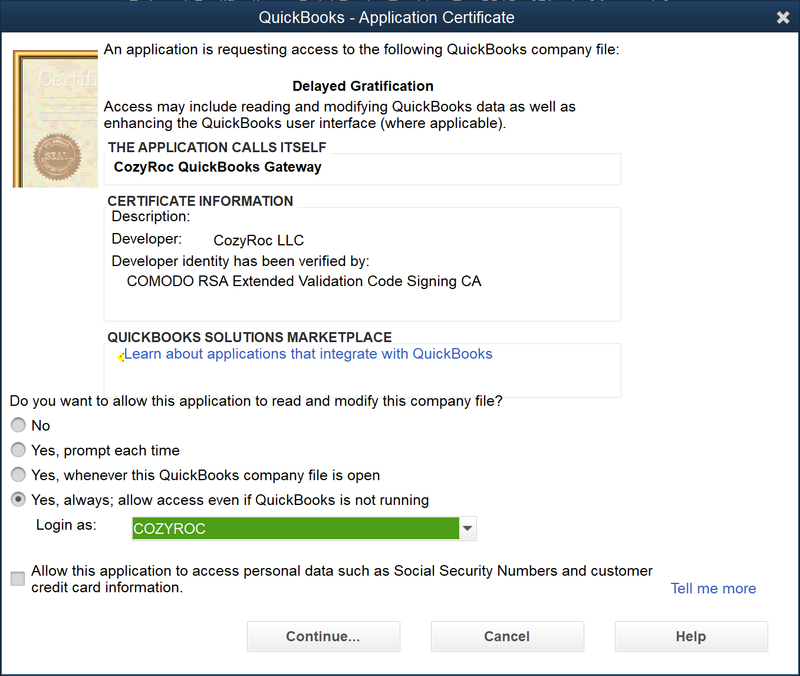 New: Support for QuickBooks Online OAuth 2.0 authentication. New: Updated web service proxy to version 13. New: A new parameter QBXMLVersion for use with QuickBooks Desktop connections. Fixed: Failed with error when using 'ItemSites' object (Thank you, Joel). Fixed: Failed to generate new token for the latest QuickBooks Online service. New: Support for QuickBooks Online Data Services. New: A new parameter 'Inactive sessions close' in QuickBooks Desktop Edition Gateway to close sessions after specified time of inactivity.